If your garden or backyard is lacking in trees to support birds' nest boxes or bird feeders, we've got the solution for you--a weather-resistant pole for hanging any wooden, post-mounted nest or feeder box! 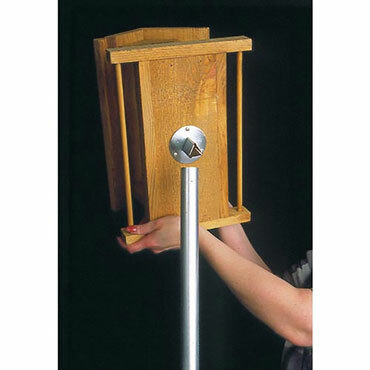 The pole is sturdy, single-section, and made of steel, able to withstand even extreme weather conditions to provide backyard birds a safe and easy place to enjoy a few treats or to build a nest. Worried about squirrels interrupting the fun? This kit is compatible with our Squirrel Baffle! The kit includes a back-mounting flange (for the nest box), bottom-mounting flange (for both feeders and nest boxes), 66" steel pole, and 8.5" Phillips pan head screws.